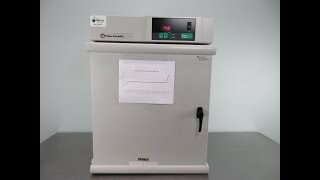 The Fisher Isotemp Standard Lab Incubator 11-690-637D provides excellent temperature recovery and stability in a stackable instrument. This gravity flow incubator is an ideal choice for everyday laboratory procedures, such as drying and staining of slides, paraffin embedding, tissue culture work and much more. This lab incubator has a temperature range of 30°C to 75°C (86°F to 167°F) and can be programed through the digital interface in increments of 1°C, with an automatic overtemperature protection at 3°C above set point. This durable, 3.75 cu ft incubator is constructed with a powder coated exterior, a stainless interior that resists corrosion, stainless shelving and a tempered glass door that allows users to check on samples without great disruption to the environment. This Fisher Isotemp Standard Lab Incubator 11-690-637D has been fully inspected and comes with a current temperature validation report. All of our lab equipment comes backed with our standard warranty. Should you have any questions, please don't hesitate to contact us.